This page is about the classic switching puzzle invented by John Allen, the famous model railroad pioneer. 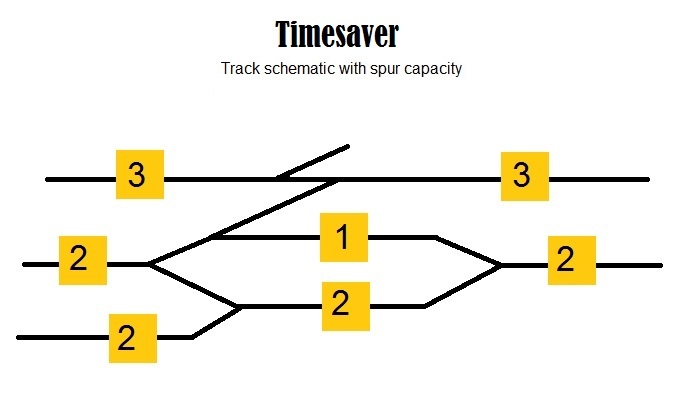 The trackplan is simple, but has been enjoyed by many people since it's introduction by John in 1972. The lengths of track and arrangement of switches have been designed to make you have to think about how you move the cars. We are presenting the most authentic design and rules as were put forwards by John himself, honoring John, and also as a correct representation for assisting Boy Scouts in achieving a merit badge in railroading. Again, the numbers show the capacities of cars on that section of track. Our representation will use all LGB track, and R3 switches. We will use 5 "G scale" 1:29 freight cars, and one loco, all of these are approximately equal length. In the pictures below, the locomotive is the orange box starting in the "middle". The goal is to put the cars in the starting order below, and then use the least moves and time to get to the "ending" locations"